Looks like it could have had much simplified design if made in to a MIDI AU for multiple instancing, seems a lot of developers are boxing themselves in to a corner, the days of one trick ponies are gone. Cool, more people creating the better, i always find it inspiring. I took it more as a nod to a source of inspiration, but yeah, even in this era of Norm Destroying, it was somewhat odd. That said, as much as I enjoy Fugue Machine, it hasn't been updated in a year, and the developer has been deep into his next project, so fair game, I say. I'll field this one? It's a little nervy to kind of reinterpret someone's innovation — the fugue paradigm — and then say you're going to challenge it. I just took it that he mentioned Fugue specifically, but I will let him speak for himself. Due to the global nature of communication, there may be some misinterpretation. I can say something like “ I rival at your accomplishments”, which means more along the lines of, I am amazed, and it’s a compliment, as opposed to a strong competition. Its like they give it up to you in praise. It’s more like saying I wish I was able to do what you have done, to imply a desire to replicate or be as good as.. inspire. Rivals = As good as. It comes across as egotistical at best, let your users decide if it is as good as or better than, no need to tell them and invoke a competitors name, it is extremely petty. Seems standalone only which is a shame or am I missing something apart from midi out. I'm sure it wasn't an outright dis. It's just a little bit weird. Like if Behringer had referred to its Mode D not as a "legendary analog synthesizer" but as a "total Minimoog ripoff." Just jumped on the beta for this. It’s much more of a Turing Machine. It’s way different from Fugue. Loads of generative options. Yeah, "will rival Fugue Machine" sounds a bit aggressive to me. Doesn't seem in the spirit of the music app dev community, which from a customers perspective always comes across as more mutually supportive, than competitive. I'm sure it'll be a great app though. Just a quick spin, and I agree that it rivals Fugue Machine. It seems to do all that Fugue Machine does, but goes way, way beyond that app. Pretty exciting, as Fugue Machine has been one of my top apps since I first bought it a couple of years ago. That said, I’m really liking the ideas in this thing. Exactly! Is the app good? All is forgiven! It doesn't seem to be AB/IAA. Can't find it in AB3, AUM, Apematrix or Cubasis. Worth noting: Fugue Machine is! Just read that it’s the developers first app and he has to learn how to implement auv3/audiobus/iaa. He seems to be listening to what folks are telling him over on the Elektron forum. Hi, this is my app. By rival I meant it would match the ease of use / functionality of those sequencers (that's the goal at least), not that it was better than them or would make them obsolete. Just been playing with your app, it’s frickin awesome 👏 I guess the first step is to ask if you can get it working as a IAA? Thanks for making the beta open and first five minutes with the app was impressive. 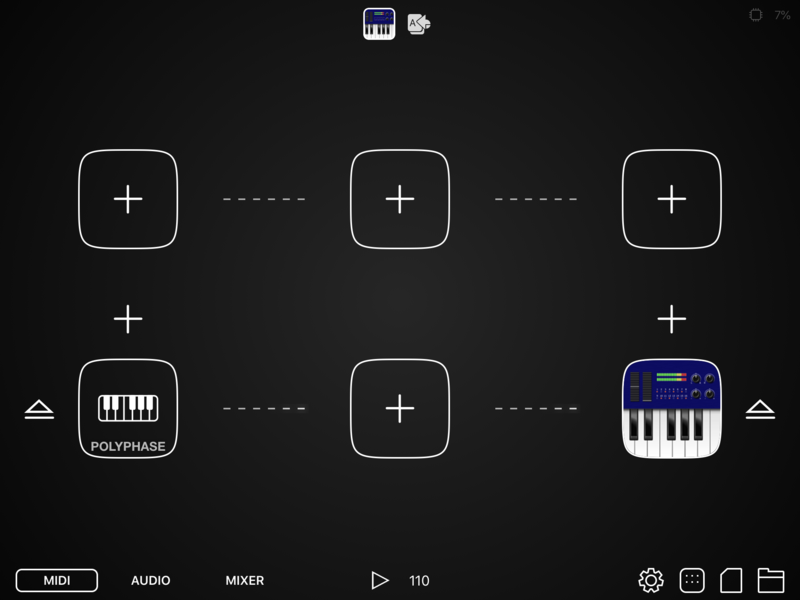 Hope you can add Audiobus support soon. I’m sure you already have been informed by now but there is a developer section to audiobus forum you can join and obviously there people can actually advise you somewhat on various integration methods I would imagine. Yep, I'm sure I'll be needing their help soon enough! It definitely takes Sequencers functionality to the next level seems pretty stable no crashes for a beta. The other immediate addition that springs to mind is Ableton Link support a must for a Sequencer. Yep, Ableton Link is on the list. The first update after release will add selectable interfaces per Track, instead of just MIDI Channels. Once I feel everything is stable and I clean up the code, I will tackle integrating it with the outside world (Link, IAA, etc). 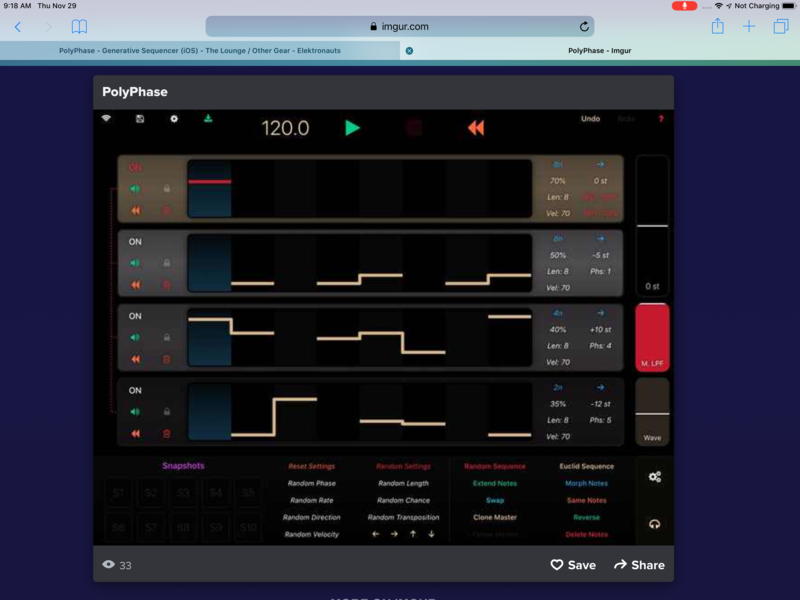 Good to see it plays whilst in the background and shows up as a virtual connection inside Audiobus.